Exploring a region of North NJ through historical photos, memories, and ephemera. Long-time area residents remember the exquisite dining experience known as the Swiss Tavern. The place had been some sort of eatery for years before it opened its doors, in the early 1930s, as a full-fledged restaurant under the management of Ernest Alpsteg, the owner-chef from Switzerland. 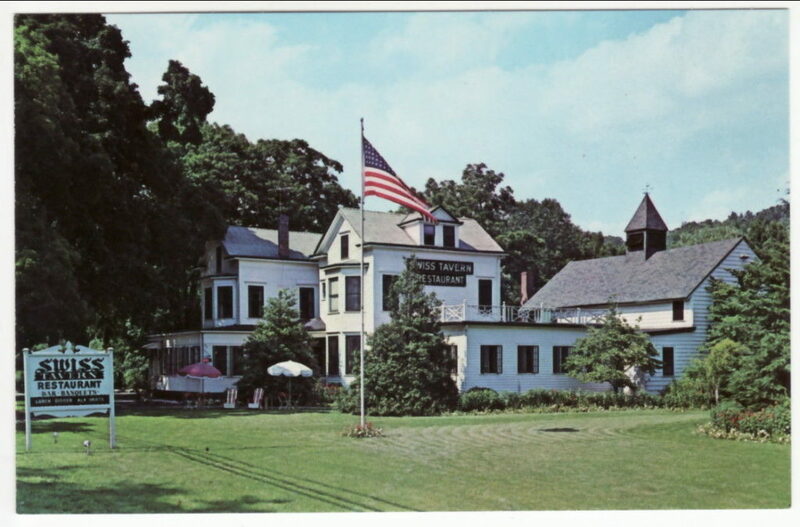 His son Hans and his wife, Agatha, by all accounts turned it into an first-rate dinner destination during the 1960s and 1970s; Swiss Tavern was rated ‘four stars’ by the New York Times. …the Swiss Tavern in Wayne began life as a speakeasy during Prohibition. The family of the present owner‐chef, Hans Alpsteg, turned the century‐old frame house into a full‐fledged restaurant in 1934, but managed to retain the Victorian coziness of the small parlors and the Victorian splendor of the large bar and grill. The NY Times reviewer was enthusiastic about the fare, describing it as “excellent” and “delectable”. A stylized aerial view of the restaurant. The owners gave it an address in Pompton Lakes, but it was actually located in Wayne. Note the fountain pond out front where live trout were kept. There was even a fountain pond out front, stocked with live trout, where patrons could check out the fish, have the chef catch it in a net, and have it cooked to order. Besides being a lunch and dinner haven, the Swiss Tavern was something of a social center as well. Rotary meetings and political get-togethers were held there; local mayors held meet-and-greet functions; the Pompton Lakes chamber of commerce held its annual dinner-dance there. Large dinner parties were not uncommon. Many a wedding party held its reception there, as well as later anniversaries. The place stayed in the family until 1979 when the Alpsteg family sold it, whereupon it became a French restaurant, L’Auberge de France. For four months, the establishment continued to be known as The Swiss Tavern. But two months ago, it became L’Auberge DeFrance, translated literally, “The French Inn.” Unfortunately, something was lost in the translation, or the transformation, if you will. The food was just fair to middling, according to the reviewer, but with “big league” prices, and noted that “it is a rarity to find a dish that totally satisfies at this new restaurant.” The review concluded by lamenting “It is a pity when a restaurant as good as The Swiss Tavern leaves us, but more’s the pity when its successor leaves so much to be desired.” The reviewer pronounced it merely “fair” — no stars. Unsurprisingly, it didn’t succeed. I don’t know when the restaurant closed for good (I understand it became other eateries including the French Quarter and the Red Fox Inn), but the long-abandoned building is slowly crumbling. A website called “Abandoned but Not Forgotten” visited the place at some point; see the photos here. The Swiss Tavern building (Google Street View, Aug 2018). The fountain pond, foreground, once held trout served by the chef. Update: The building was razed on April 9, 2019; it seems a WaWa will be built on the site. As anyone who has lived in or near the Pequannock valley knows, we get floods from time to time. The convergence of three rivers makes it inevitable whenever there is prolonged and copious rain. 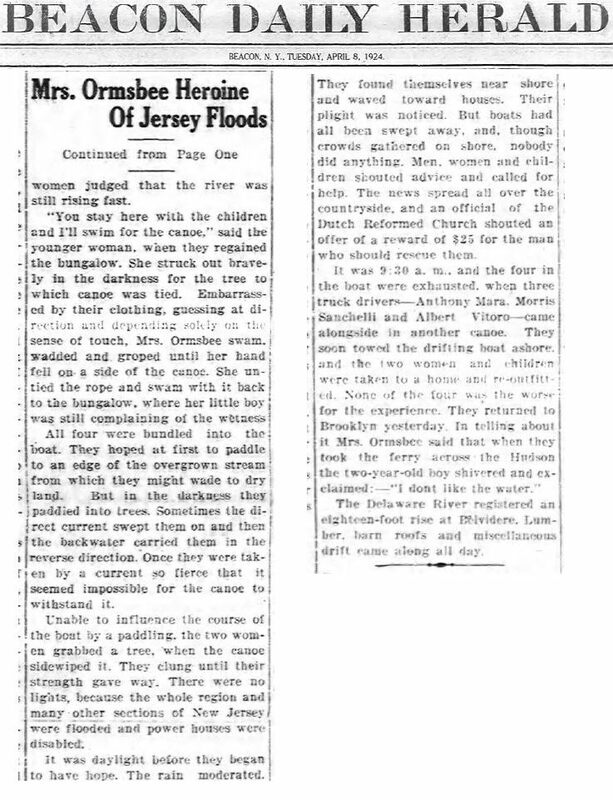 I’ll write a post on several infamous floods at some point, but this post is about a flood that took place in April 1927, and a young mother, camping out in a riverside bungalow in Pompton Plains, who rescued her family from one. I can’t match the breathless writing of this newspaper article, so I’ll just post it. Click on each image for a full-sized and readable version. I’ve added my comments afterward. Part One of this incredible tale. Click to open full-sized image. Pretty incredible, right? 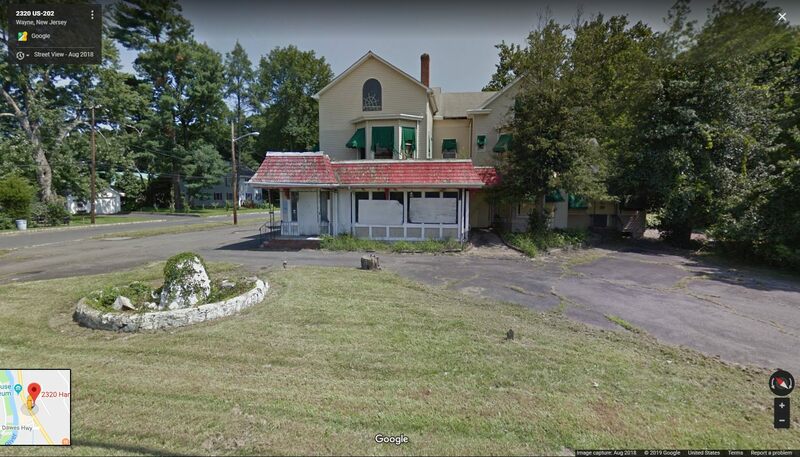 Imagine you’re in the middle of nowhere (Pequannock Twp was a lightly-populated village at this point), sleeping soundly in what was probably a one-room bungalow right on the river. You are awakened by odd sounds, you swing your legs off the bed and… into knee-deep water. Since the article only calls her “Mrs. Ormsbee”, I took to the Ancestry website and discovered that her name was AliceShe was born Alice Miller in Beacon NY in 1900. She was 24 at the time this happened. With her was her mother (age unknown, but likely in her 40s) and her two young children, a son aged two and four-month-old daughter. Part Two of this incredible tale. Click to open full-sized image. So: It’s the middle of the night, it’s raining , your cabin is flooding, and it’s pitch black outside because the power is out. She leads her mother and two very young kids through the darkness to the bridge, hoping to get to the main road, only to find herself falling into the river because half the bridge is gone. She grabs a canoe and gets her family into it, and they all endure a night of terror until they’re rescued in the morning. But what an incredibly brave young woman, at a time when women were widely regarded as kind of helpless, and weren’t expected to do or know much. Her two-year-old son, Roland, because a doctor and died in 1995. I don’t know when or where Alice passed, but I’ve reached out to someone who has her in his family tree. Perhaps I’ll learn more. Born in 1847 in New Brunswick NJ, he attended public school there. He was admitted into the College of Physicians and Surgeons at Columbia University in New York City, and graduated in 1872. 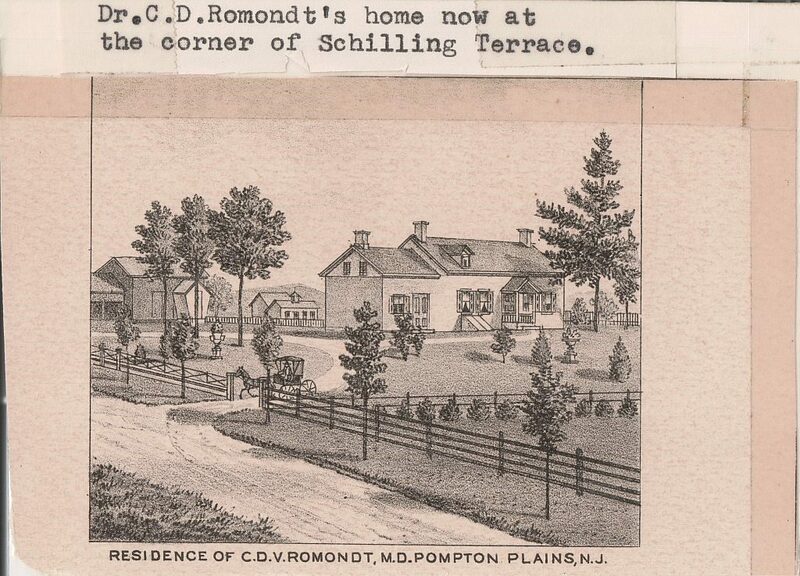 He practiced medicine there for a few years before deciding to move to Pompton Plains in 1878. Besides his medical practice, Van Romondt served as the township’s health inspector, as well as the medical inspector for the schools there. He also found time to be employed as a medical examiner for several insurance companies. In 1890 he married Anna Doremus, who assisted her husband during his long medical practice in Pompton Plains. The doctor was a member of several civic organizations, including the Junior Order of United American Mechanics. This group met at Paul Revere Hall, which isn’t surprising given the J. O. U. A. M. built it. You can view the cornerstone — today, the building is known as the American Legion Hall. He died in 1926 and is buried at the Reformed Church. 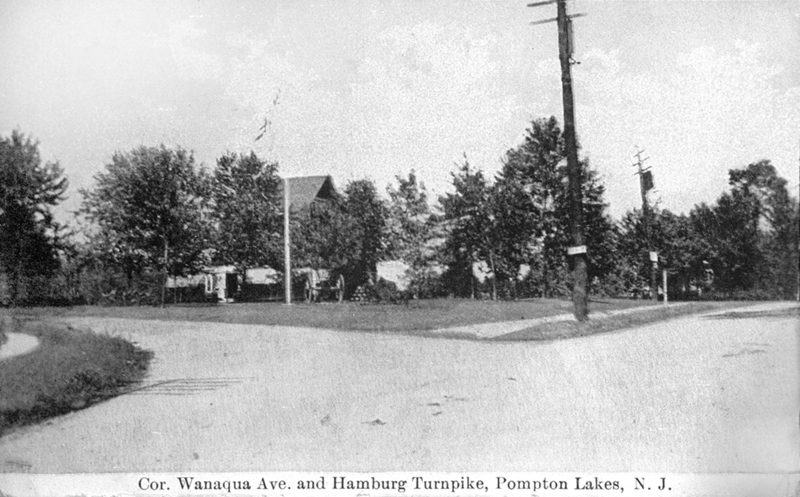 The intersection of the Paterson-Hamburg Turnpike and Wanaque Avenue, in Pompton Lakes, has featured several noteworthy structures. Here’s one of them. 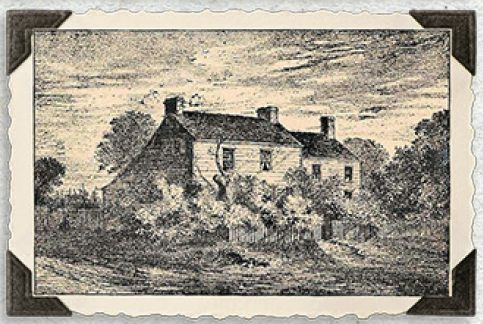 The Yellow Tavern, from an 18th Century drawing. A memorial consisting of a cannon (Civil War, perhaps?) 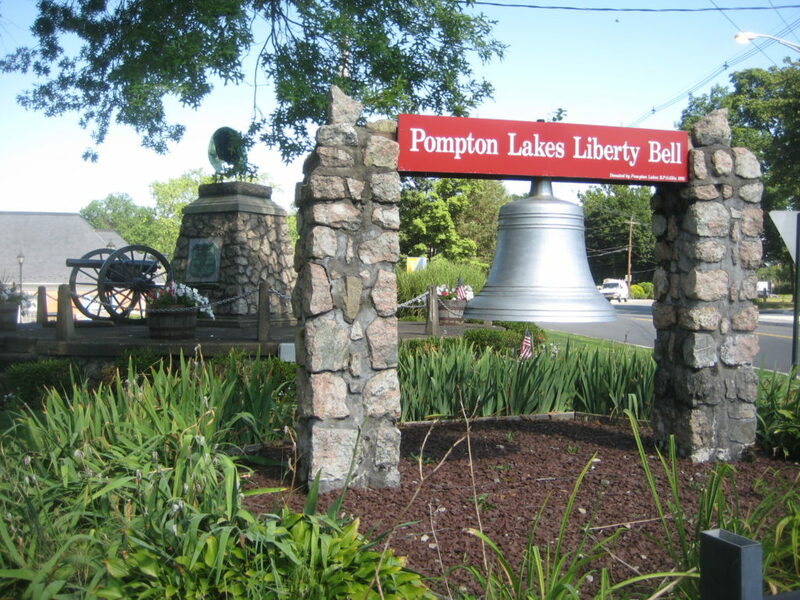 and a stack of cannonballs stood upon the triangle of land at the historic intersection until 1914, when a town memorial was dedicated on the site, on Labor Day, to honor several Pompton Lakes residents who lost their lives when the U.S.S. Maine exploded in Cuba’s Havana Harbor on February 15, 1898. This tragedy cost 260 American lives and later led to the Spanish-American War of 1898. 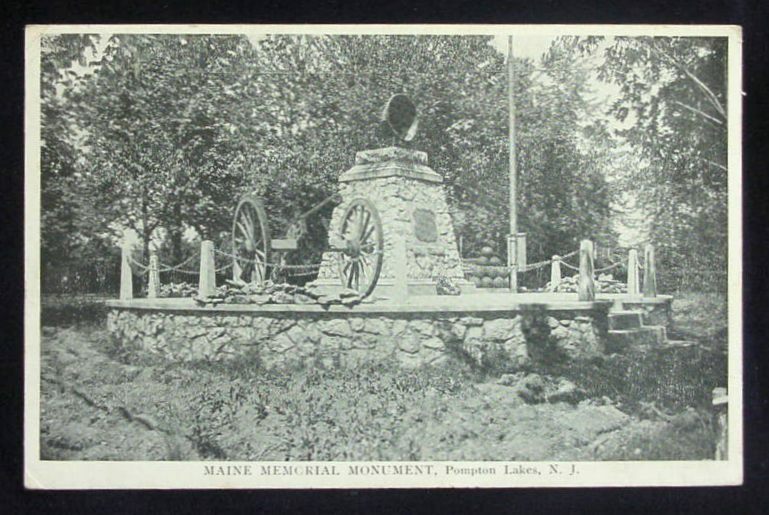 The site was used as a war memorial for many years before the Maine memorial was erected. Consisting of a raised round platform and a fieldstone-and-concrete tower, the monument on the triangle — also known, for some reason, as Federal Square — “contains a copper ventilator from the Maine battleship. 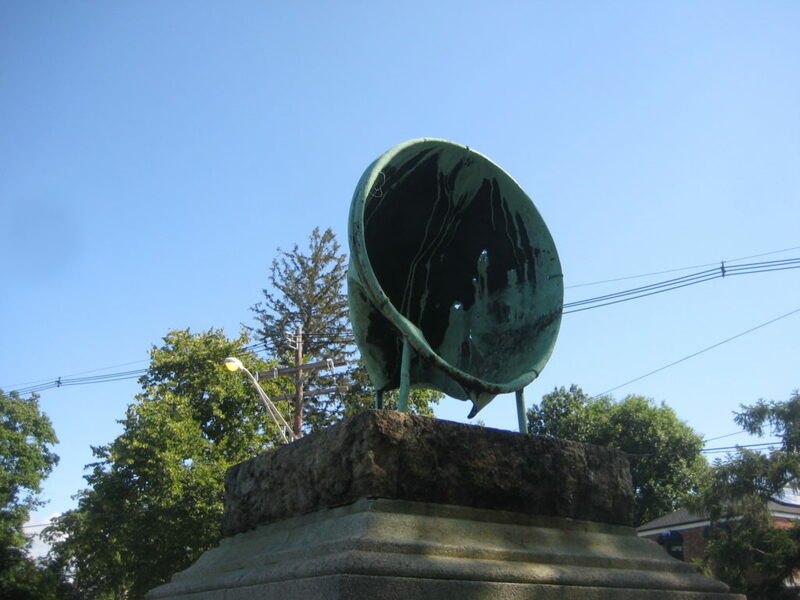 The ventilator was transported to Pompton Lakes by Harry Hershfield, a Pompton Lakes Mayor who went on to become a state Senator.” As you can see in the photo below, the existing memorial was incorporated into the design, and a chain was draped around the raised platform. This photo was taken about 1918. Click for full-sized image. 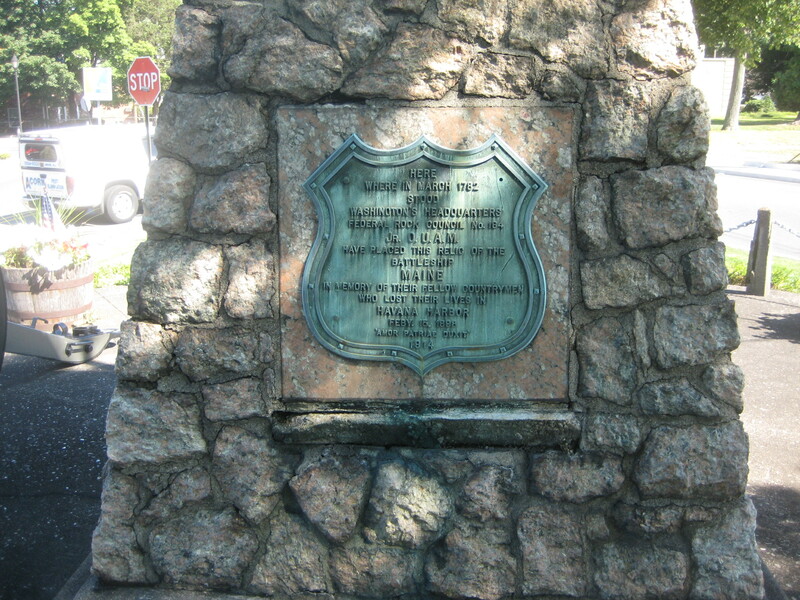 The plaque on the memorial, in honor of the local members of the Council of the Jr. Order of the United American Mechanics. Click for full-sized image. Since then, few changes have been made to the memorial site, which now features nice greenery and a historic marker denoting the site of “Washington’s Headquarters”. 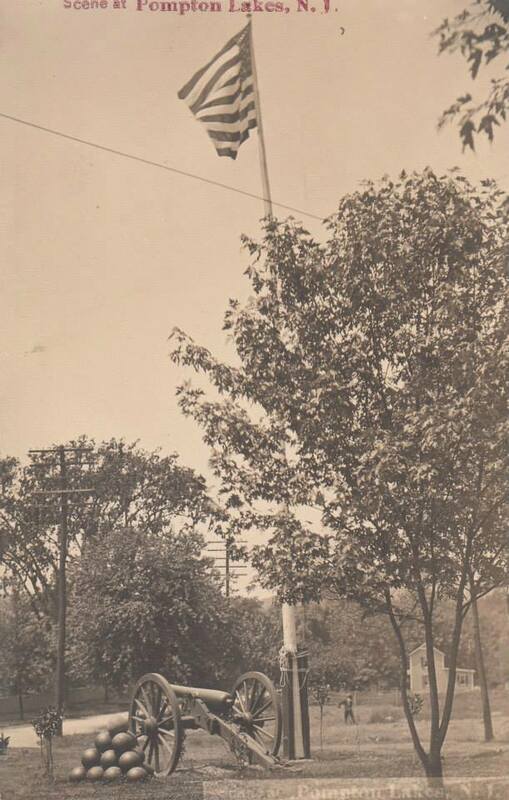 The cannonballs were removed at some point, and a Liberty Bell was donated by the Elks Club. The Liberty Bell was donated by the Elks Club in memory of the men who lost their lives in Havana Harbor during the Spanish American War. Click for full-sized image. And so the Maine monument at Federal Square has remained, nearly untouched, although time is taking a toll. The copper ventilator, unprotected from the elements, has been slowly disappearing over the past century. Click for full-sized image. [P]opular opinion in the U.S., fanned by inflammatory articles printed in the “yellow press” by William Randolph Hearst and Joseph Pulitzer, blamed Spain. The phrase, “Remember the Maine! To hell with Spain!”, became a rallying cry for action, which came with the Spanish–American War later that year. While the sinking of Maine was not a direct cause for action, it served as a catalyst, accelerating the approach to a diplomatic impasse between the U.S. and Spain. Later investigations would plausibly suggest that the explosion was more likely caused by a magazine explosion within the vessel, possibly caused by a coal fire. Once upon an era, every town and village had a hardware store. In many instances, it was also the general store, post office, and community center where men would discuss the matters of the day. Frank B. Whittle was born in England in 1860, and (presumably with his family) came to America in 1870. 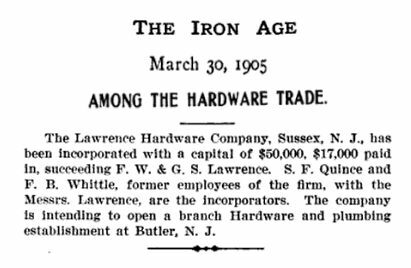 He lived in Sussex, where he had a position with the Lawrence Hardware Company. He met and married Harriet Beemer and had a daughter, Edith, in 1886. Apparently an upstanding citizen, Whittle was at various times the Borough Clerk, the Registrar, and chief of the fire department. In 1905, the company incorporated, with S.F. Quince and Frank Whittle, “former employees of the firm”, as the incorporators. Frank and his family moved to Butler, where he opened the branch store downstairs from the Butler Opera House. A fire in December 1906 destroyed the Opera House and several nearby structures. He was fortunate that a sturdy three-story brick building had been recently finished at 208 Main Street. This became the new home of The Lawrence Hardware Company, which sold plumbing, hardware and heating supplies. He ran this store until 1915, when he moved to Pompton Lakes to open another branch store. Still interested in local affairs, he was at some point elected mayor. In 1921, he bought the store and ran it under his own name. Correspondence with Lamson & Goodnow, a Massachusetts cutlery company. 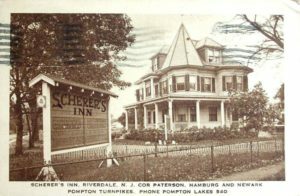 He remained in Pompton Lakes until 1923 when he sold the business and, the following year, organized (and was president of) the F.B. 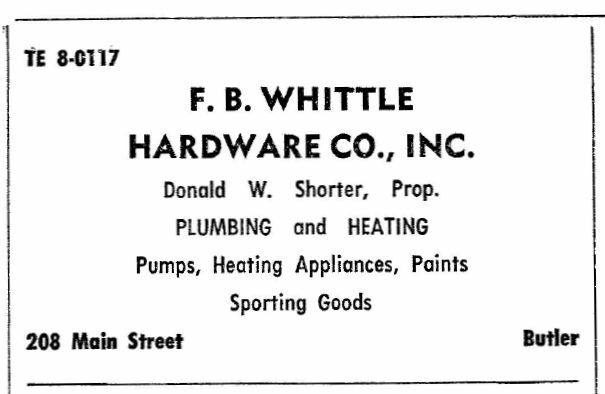 Whittle Hardware Company. Soon after, he purchased the Butler store. It was operated under his name until the store closed in 2001. Whittle Hardware as most of us remember it. 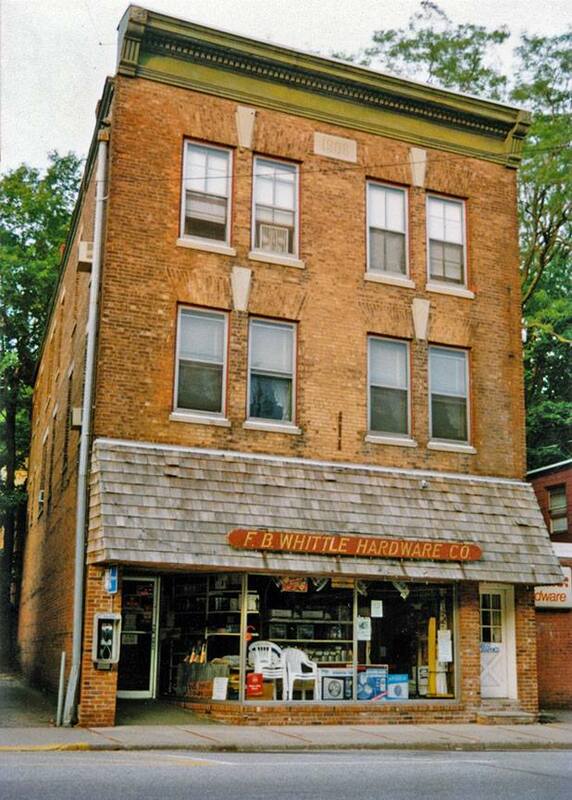 Frank B. Whittle died in 1928, but the store stayed in the family. 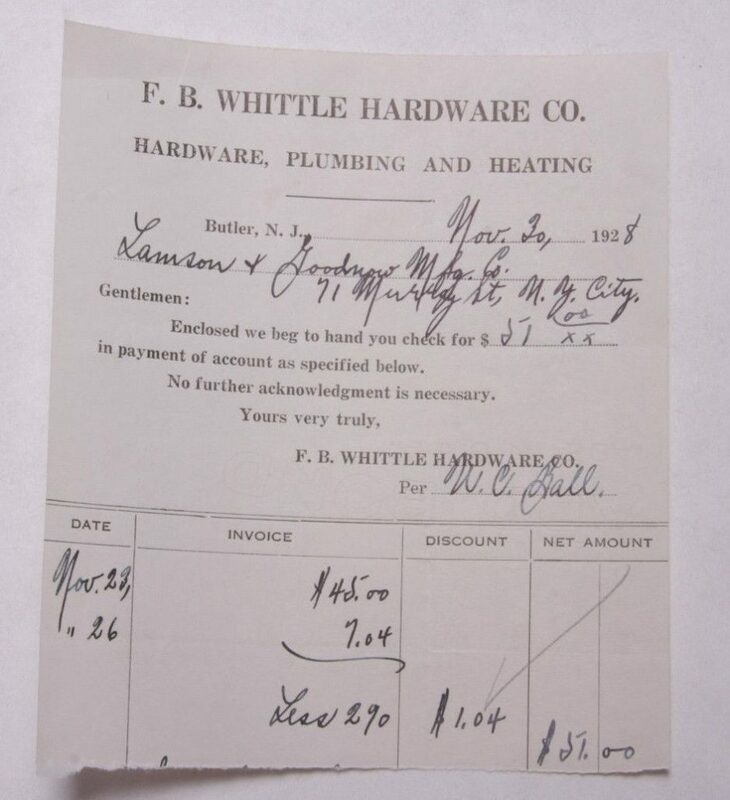 Edith Whittle had married Irvin Shorter in 1905, and their son, Donald, took over the store. It was run by the Shorter family until the late 1990s. The store was sold, but closed permanently in 2001. 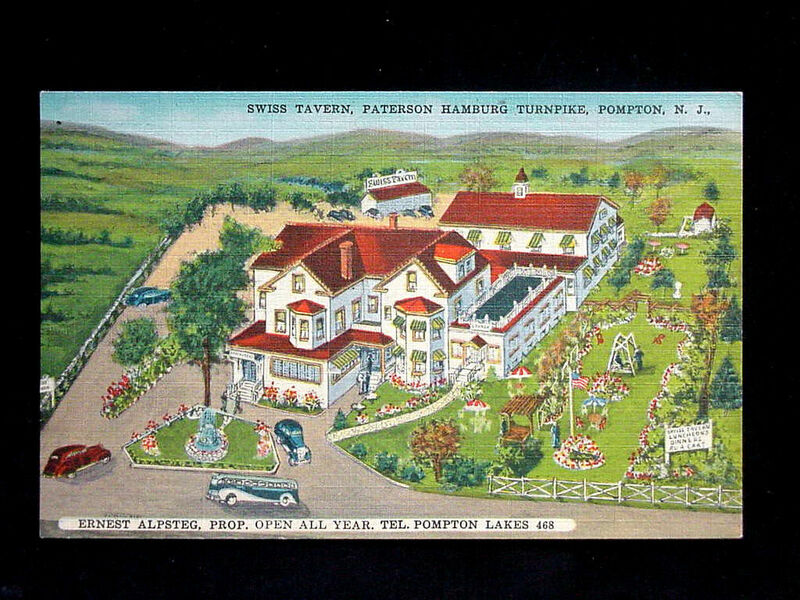 The history of this place begins with Joseph Slater, who around 1861 bought Ford’s Mill, located on Paterson-Hamburg Turnpike near the intersection of Newark-Pompton Turnpike. That mill became Slater’s Mill, which processed felt for hats. A relative (brother? Don’t know yet) named Otis built a house across the intersection on the southeast corner. I don’t know anything about the intervening period, but at some point in the 1920s the house was purchased by a German immigrant named Joseph Scherer. He turned the place into a restaurant/guest house he named “Scherer’s Inn”. Scherer and his family — a wife, four (or five) children, and some others — lived there as well as ran it. I haven’t delved deeply into the Scherer family, but I know Joe Scherer was born about 1880. At the time the next owner, Bert N. Lamb, took over about 1941, Joe would have been about 60, and probably ready to retire after four decades or so of running an inn. 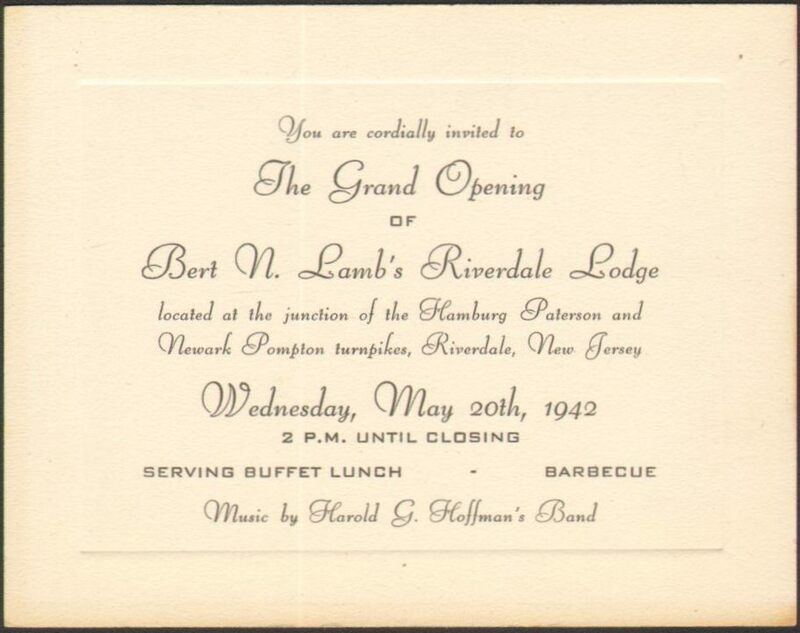 Bert Lamb, a New York entrepreneur, renamed it “Bert N. Lamb’s Riverdale Lodge”, and held a glorious grand opening on May 20, 1942. 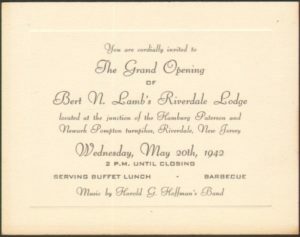 The place was open from 2 p.m. “until closing” and offered a buffet lunch and barbecue, accompanied by the sounds of Harold G. Hoffman’s band. At some point — I want to say the 1970s, but perhaps earlier — the decision was made to widen that portion of the Newark-Pompton Turnpike. That spelled the end for the venerable old house. Today, the site is occupied by a gas station. Judging by the car, this is early 1900s. The large gold sign on the store reads “Goldstein Bros” … currently there is no third & fourth story, due to a fire. This is the large building formerly occupied by Levine Bros clothiers. Main Street, Business Section, Butler NJ in the early 1900s. Click for full-sized version. The store next door, closer to the photographer, has no large sign, but you can read “Soda” at the bottom of the window. 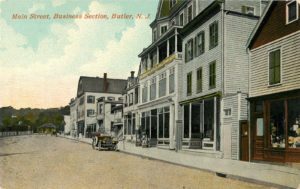 This is the building currently occupied by Butler News & Candy Shop (150 Main St) — largely unmodified since this postcard! 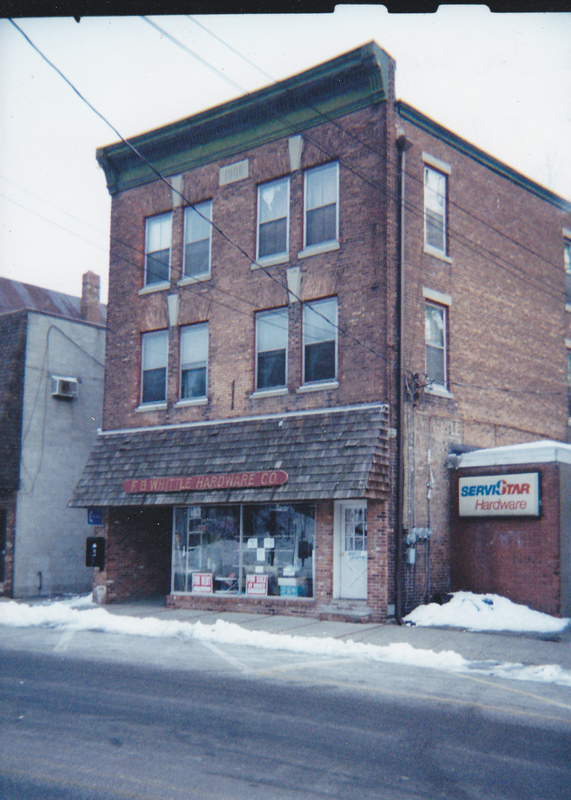 The building closest to us is at 144 Main Street, currently occupied by Alvino’s Barber Shop. The building to the left of Goldstein’s would then be the WCTU building (156-158 Main St), currently occupied by Mizuki restaurant. It appears the roof was rebuilt and is, today, higher than in this photo. Indeed, it appears that the WCTU sign is there, hung above the second-story porch. The next building beyond, a house, at 160 Main Street is currently Vanderhoof & Sons Custom Heating. And note you can see the RR station at left, down the block. October 24, 1937 was a bleak day for Pequannock Township. 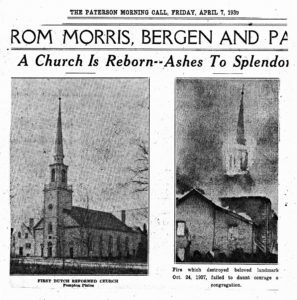 In a matter of hours, the First Dutch Reformed Church, first constructed in 1771, was entirely gutted by an early-morning fire. It took the combined efforts of 70 firemen from six other communities, in addition to Pequannock, to bring it under control. There’s some fascinating video footage of the fire here, filmed by resident and local historian Carl Edwards. If you watch closely, the camera sometimes pans around to show the surrounding area. It took the congregation less than a year and a half to completely rebuild the church from “ashes to splendor.” There’s video of the rebuilding process at this link, again courtesy of Mr. Edwards. The church is still in use today, known as the First Reformed Church of Pompton Plains. 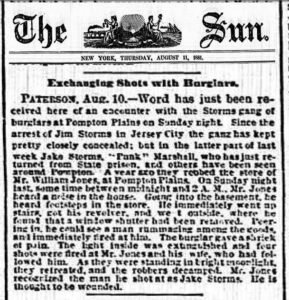 A year ago they robbed the store of Mr. William Jones, at Pompton Plains. On Sunday night last, sometime between midnight and 2 A.M., Mr. Jones heard a noise in the house. Going into the basement, he heard footsteps in the store. He immediately went up stairs, got his revolver, and went outside, where he found that a window shutter had been removed. Peering in, he could see a man rummaging among the goods, and immediately fired at him. The burglar gave a shriek of pain. The light inside was extinguished and four shots were fired at Mr. Jones and his wife, who had followed him. As they were standing in the bright moonlight, they retreated, and the robbers decamped. Mr. Jones recognized the man he shot as Jake Storms. He is thought to be wounded. No idea where William Jones’ store was, or for that matter, who he was. I asked Rob Jones, but he didn’t recognize the name as part of his family tree. His grandfather took over an existing hardware store in April 1929, but that’s all I know, except that at one point, the place was a general store (and likely a post office) run by the Berry family. I haven’t had any luck, so far, tracing the elusive Jake Storms further in history. Did he survive? Did his gang return to burgle again? Wouldn’t I like to know. Today, the area where Route 23, Route 46, and Interstate 80 meet is a veritable ‘spaghetti bowl’ of highways, ramps, and overpasses. Decades ago, though, there was just Newark-Pompton Turnpike (Route 23) and Route 6 (today’s Route 46, but it’s been renumbered a lot). In the 1960s, before I-80 came through, this was what the interchange looked like. This photo shows us looking east. Route 23 is at left and at right. Some remember there being traffic lights on the traffic circle. 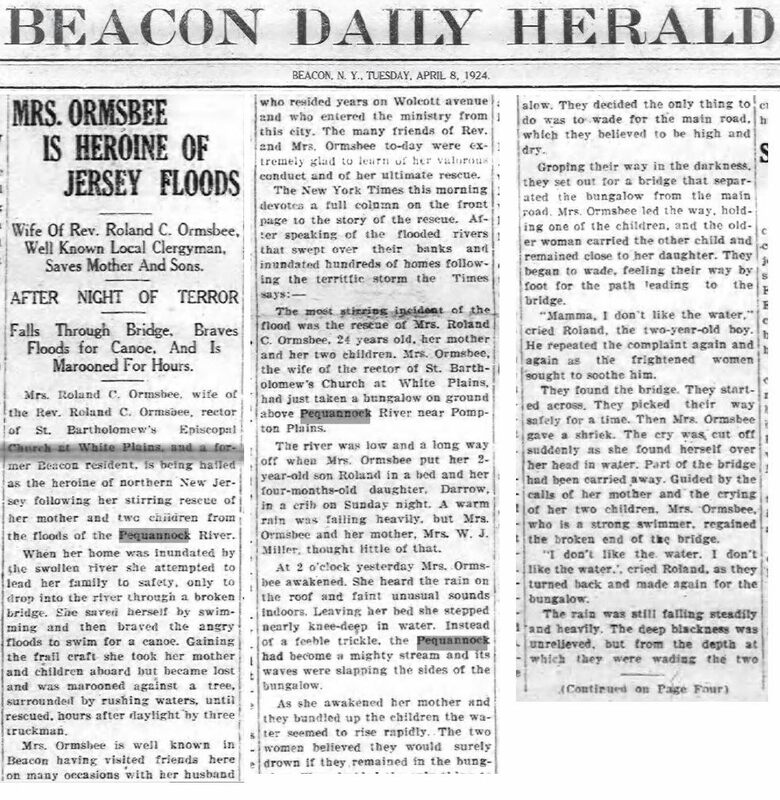 Historical photos & newspaper articles about several north NJ towns. Registration is disabled until I find a way to defeat the phony ones. But I’m easy to reach.